Last week in the hubbub surrounding the announcement of what will and won’t be included during the summer season at Disney’s Animal Kingdom, the celebration of the park’s 18th anniversary, and the signing by Joe Rohde something may have been missed. Yes, Joe Rohde was signing his awesome artwork, but he was also signing a book. From every outward indication this is a coffee table book with some wonderful wildlife photographs and maybe some insight into Disney’s animal programs and conservation efforts. It is, in fact, so much more than that. Let’s start with some basics, The Disney Conservation Fund: Carrying Forward a Conservation Legacy was created by John Baxter. This is Baxter’s second book for Disney Editions, his first being the engaging read, Disney During World War II. While Baxter is the main voice here, there are plenty of others chiming in. Isabella Rosellini, Dr. Jane Goodall, the aforementioned Mr. Rohde, Dr. Jackie Ogden, Dr. Beth Stevens, Bob Iger, and even Walt Disney himself are just a few of the individuals tapped to share a few words over the course of the book. The book doesn’t have chapters, per se, but it is easy to find four distinct segments within the 144 page volume. The opening section is a history of how we have arrived at this point in Disney’s conservation efforts. We start with Walt’s love of nature and the True-Life Adventures before being led through a progression that includes Disneynature, the ideas of Disney’s Wild Animal Kingdom, the creation of the park we know today, and the need for Disney to assemble an advisory board and conservation fund well before the park ever opened. Once we pick up the thread of the conservation fund, we move through its various incarnations and the highlights and celebrations of the fund’s first and second decades. There are some wonderful details throughout these opening passages, and it is a perfect primer for those not as well-versed in the history Disney shares with the wild world. There are even moments where one of the guest writers will give those who know the story some new tidbit or something poignant to chew on. From here we move into my favorite portion of The Disney Conservation Fund. 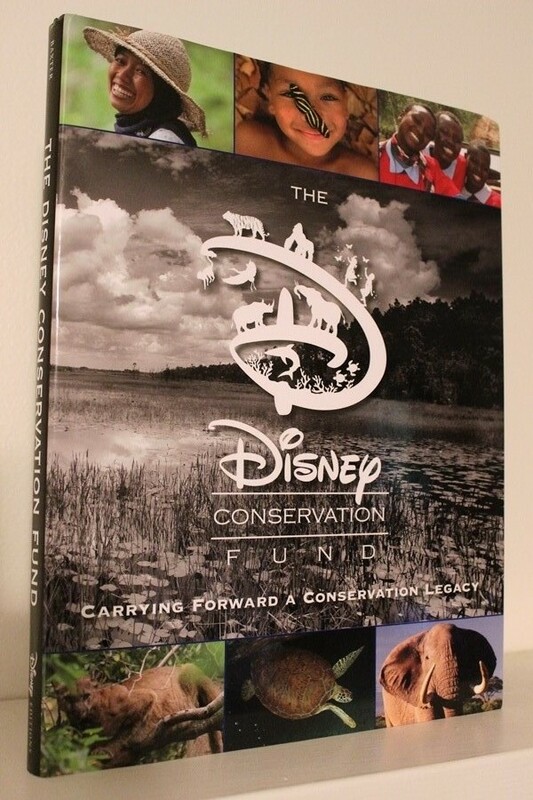 For approximately 45 pages we are treated to updates from many of the programs the Disney Conservation has funded over the past 20 years. Each double page spread includes a photograph of the work in action or someone affected by the program, the name of the program, where it is taking place, and a brief passage about the impact the conservation fund has had on it. For those of you who have been giving to the fund over the years, this is your reward. This is where you get to find out what those dollars went towards and what kind of work is being done all across the globe. The next segment is very brief, but is critically important as it looks ahead to the main thrust of the work the conservation fund for the coming decades. There will be two driving initiatives, or mission statements, that all future work will be divided into and you should get used to hearing both. First is Increase the Time, as in the amount of time children spend in nature and their ability to access natural environments. The second is Reverse the Decline, in other words taking a look at threatened animals and what can be done to preserve the habitats of threatened animal species and help them flourish. It is this second charge that leads us into the final, and largest, section of the book. Like the program updates, these pages are animal specific. Everything from elephants, rhinos, primates and large cats to butterflies, rays, and migratory birds are given ample space in the showcase. Like before each is accompanied by a photograph, sometimes even an additional double splash page. The dangers each face and what is currently being done to try to stem the tide for these creatures make up the text pages. Couple these with the program reports, and The Disney Conservation Fund sends out a very serious message. The hope of this book is to inspire the next generation that will be picking up the conservation torch. While there is good work happening around the world, it is likely that these young conservationists will face even greater challenges. Yes, it is a coffee table book. Yes, it has some exquisite photography inside. And yes, it is expensive (it has a $40.00 cover price). None of that should deter you from picking it up, uncovering the stories that touch your heart, and connecting your story to the history that has come before. John Baxter does an amazing job weaving together a narrative that is as fluid as it is poignant, and The Disney Conservation Fund: Carrying Forward a Conservation Legacy is well worth picking up. If you need any more convincing, just glance at a copy for yourself. Turn to page 9 and read the words of Walt Disney as he explains the business of conservation. I promise you that it will convince you to keep reading. Thanks for mentioning this book. This is one aspect of Disney that doesn't get enough attention - his love of nature. For a small donation I was able to get a pin for the Disney Worldwide Conservation Fund which says "The Land At Epcot" on the bottom. It is one of my special treasures. They (the little kiosk by Soarin') have a sorts of related items. They also play some great videos on the in-room TV at the resorts about Disney Conservation. It gives me hope. I forgot if already asked/answered. Did your plant survive?